Figure 30-1. Rapid diagnosis of acute promyelocyte leukemia with the PML-RARA fusion by PML immunostaining. In leukemic blasts from cases of PML-RARA-negative AML and in normal cells, PML protein is localized within nuclear body structures (PML nuclear bodies). In such cells PML antisera detect a wild-type staining pattern comprising less than 30 (typically 5-20) discrete nuclear dots, e.g., a case of AML Ml (upper left panel). 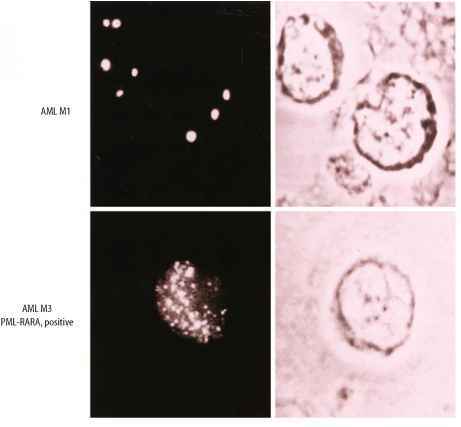 Whereas in APL cases with the PML-RARA fusion, PML nuclear bodies are disrupted, leading to a characteristic microspeck-led/microparticulate nuclear staining pattern (>30 nuclear dots) with PML antisera, which detects PML-RARA and wild-type PML proteins (lower left panel). Nuclear integrity is confirmed by a nuclear stain or in this case by phase contrast microscopy (right-hand panels). These studies were performed with a PML polyclonal antibody, with FITC conjugated secondary antibody. 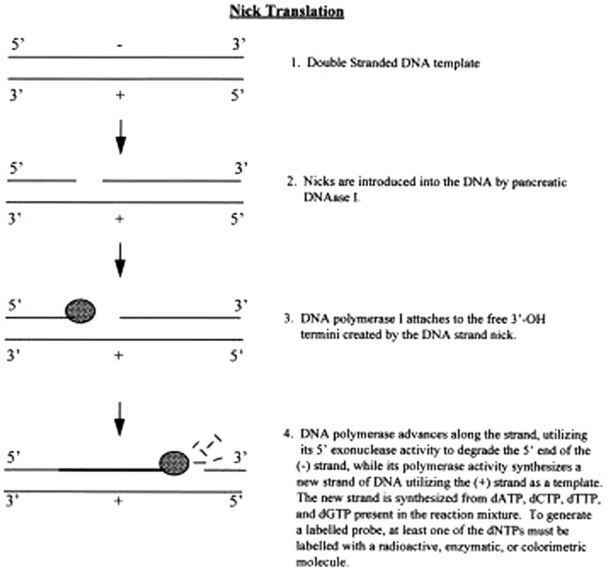 RARA fusion transcript may be used to confirm the diagnosis of APL. Immunophenotyping is a valuable component of the routine diagnostic workup for patients with AML for a number of reasons, including (1) establishing, confirming, and further refining a diagnosis of AML, (2) identification of potential prognostic markers, and (3) establishing expression profiles suitable for subsequent MRD monitoring. Although immunophenotypic studies are assuming a more important role in the investigation of AML (reviewed in Reference 18), they are not discussed in any great detail in this chapter, which is restricted to the role of molecular genetic analyses.